Kolte Patil iTowers Exente : Set sail on a journey of divine luxury that will be loved for generations to come. Bangalore is an awesome city that is home to people from around the country and the world. This city is filled with fun, peace and excitement that is different in its own way. Today, Bangalore is one of the most loved cities in the country. The real estate industry in Bangalore is booming today, transforming this city into a concrete jungle that you will truly admire. Kolte Patil iTowers Exente is one of the latest residential developments in Bangalore by Kolte Patil Developers Ltd. that takes you on a new road filled with luxury and comfort like no other. Extended over 15 acres of luscious land, this development contains the 5 tallest and magnificent towers in the area that offer 1BHK, 2BHK, 2.5BHK, 3BHK and 4BHK apartments of different configurations and area sizes starting from 710 sq. ft. and going up to a whopping 2093 sq. ft. You can choose from a range of luxury apartments that meet your requirements perfectly, apartments that you will be proud to own. Kolte Patil iTowers Exente Bangalore is a marvellous residential development which focuses on pure luxury and comfort in each and every corner. The apartments are crafted to perfection, provide amazing ventilation, natural lighting and contain extraordinary furnishings and fittings, vitrified flooring, wooden laminated flooring in master bedrooms, anti-skid ceramic flooring in utility areas and bathrooms, tough doors and UPVC windows providing eye-popping landscape views, modular kitchens with granite tops and piped gas, safety features and the list just goes on. The external amenities at this development are remarkable and contain a meditation centre, clubhouse, well-equipped gymnasium, multiple sports facilities and a play-zone for your kids, jogging track, swimming pool, theatre, multipurpose hall, Wi-Fi connectivity, café, convenience stores, ATM, landscape garden, efficient power back-up and premium security. Experience a new world of luxury, peace and serenity each day at this development. Located at Electronic City, this development comes in close proximity to a number of places like schools, universities, banks, ATMs, malls, shopping centres, supermarkets, convenience stores, hospitals, medical centres, public transport and more. Experience total convenience, save precisou tme and usei it on the things that really matter. Starting at an exclusive price of Rs.35.42 lakh and moving up to Rs.1.04 Cr. the Kolte Patil iTowers Exente price is affordable and simply irresistible. An apartment at this development is definitely worth a purchase and there is no doubt about that. There are different payment plans that you can conveniently choose from, along with home loan facilities, NRI services and more. Book now! 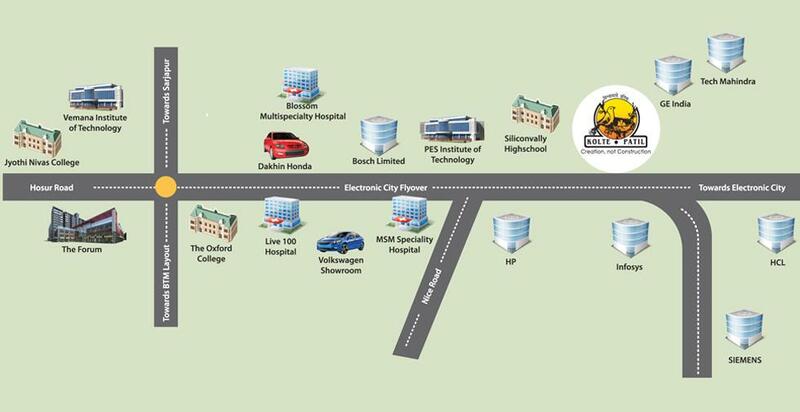 Why invest in Electronic City, Bangalore? Bangalore, also known as ‘The Garden City’, was initially a small town. All year round great weather, optimal connectivity, and good living conditions of Bangalore have catapulted it to a mega- metropolitan city of India. Bangalore, now renamed Bengaluru, has expanded exponentially, both in area and as a financial center over the last 20 years. Today, the Bangalore city is India’s largest IT hub with some of the world’s biggest IT and other multinational companies based here. Pleasant weather and a cosmopolitan buzz make it a popular choice for the NRIs to settle here. Over the years, international standard education and healthcare institutions have come up here. Being rich in art, culture, and heritage has made Bangalore a popular tourist destination too. Being the IT, telecommunications, and technology hub, a number of multinationals have set up base here. Biotech Park Helix and Electronic City are two such technology zones here. Electronic City is located off the NH-VII, and is one of the most vibrant locations of Bangalore with the likes of Koramangala which is hardly a 10 minutes drive through a direct E-City flyover. More than 300 companies (hardware/software services, telecommunications, manufacturing, and electronic) have corporate offices here. Some of the famous companies here are Infosys, Wipro, Biocon, HP, Siemens, and Mahindra Satyam. Electronic City boasts of excellent connectivity to the rest of Bangalore and other major cities of the country. The 10-lane NH-VII segment that connects the Silk Board Junction and the Electronic City is the longest elevated highway in the country today. The NICE Road (Bangalore-Mysore Structure Corridor) that connects NH-VII and Bannerghatta Road adds to the connectivity. The construction of the Metro Line has been started here by BMRCL (Bangalore Metro Rail Corporation Ltd). All these factors have made Electronic City an enviable working and living destination for the urban elite wanting both connectivity and yet a serene pollution- free environment to reside in. World-class infrastructure projects have changed the skyline of the area. A number of stunning residential projects are in the pipeline here giving investors and home buyers a large choice to choose from. One such grand project is this project, Kolte Patil iTowers Exente Bangalore. Bangalore, especially Electronic City, has seen a sharp escalation in the real estate prices in the last decade. And, the quite reasonable and affordable price ranges of Kolte Patil iTowers Exente are already commanding a high premium!